San Francisco, London, 8th October 2015 – SEGA® is happy to confirm that today Sonic is back in Sonic Dash 2: Sonic Boom™, the sequel to the mobile success Sonic Dash™, which has been downloaded over 140 million times. Shake it up: players are now able to take various horizontal and vertical paths and use the brand new Enerbeam to glide through the sky adding way more fast-paced challenges to each and every run. High-score chasers will be in heaven as we’re introducing new companions in Sonic Dash 2 called Sprites. Collect them, evolve them, combine them, and equip your team in order to multiply scores. Longer combo, shield extension, rings multiplier, longer Dash… each player will be able to choose the ones that best match their skills and preferences! 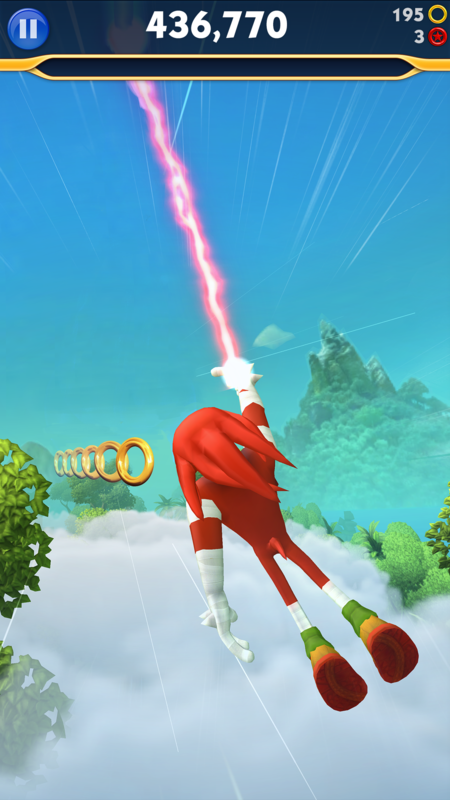 A fresh new style: Sonic Dash 2 uses the characters and universe of the critically acclaimed TV Cartoon, Sonic Boom, while remaining a genuine Sonic experience at heart. IT’S ALL ABOUT SPEED! These evolutions, and plenty of other changes, are featured in the Sonic Dash 2 launch trailer: https://www.youtube.com/watch?v=N8rvVcV6CHo&feature=youtu.be. Month after month, Sonic Dash 2 will continue to evolve: more tracks, more characters, more events, and plenty of other additions are already scheduled. Last but not least, an Apple Watch companion app is also available beginning today for Sonic Dash 2. It’s no secret that all Sonic fans like to run at least a dozen miles every day in homage to their favourite mascot. So, to reward them, Hardlight developed a Sonic-themed pedometer that measures and rewards player’s steps. The more active players are in real life, the greater their in-game rewards. Who said gamers were couch potatoes? Definitely not Sonic! The launch of Sonic Dash 2: Sonic Boom continues the franchise’s momentum led by a #1 animated series for kids, all boys, and all girls in its timeslot on Boomerang in the UK. It is also the strongest show on Canal J in France, Cartoon Network Australia and Malaysia and the number one show Cartoon Network in the U.S. The series will launch in more than 70 countries in 2016, furthering exposure for the franchise and building affinity with consumers.The Sonic merchandising program has also surged at retail led by master toy partner TOMY and with more than 150 partners across a range of key categories. Sonic Dash 2: Sonic Boom is downloadable for free from today in Europe, the Americas, Australia and Africa, on iPhone, iPod and iPad: App Store. From next week, on Thursday 15th October, it will also become available in these territories on a selection of Android devices. No dates have been defined yet for a release in additional countries. For more information, you can follow Sonic in person on Twitter and Facebook. ©SEGA. All rights reserved. SEGA is registered in the US Patent and Trademark Office. SEGA, the SEGA logo, SONIC DASH, and SONIC DASH 2: SONIC BOOM are either registered trademarks or trademarks of SEGA Holdings, Co. Ltd or its affiliates. App Store is a service mark of Apple Inc. Google Play is a trademark of Google Inc. Amazon Appstore and Windows Phone Store are service marks or trademarks of their respective owners. SEGA’s mobile division in the West has its headquarters based in San Francisco with dedicated studios across North America and the UK. Focused on creating fun, compelling and engaging games, SEGA’s games feature iconic intellectual property as well as original innovative content for mobile and tablet devices. Since 2008, it has been a leader in the smartphone and tablet space and continues to be at the forefront of mobile gaming. SEGA’s mobile studios include Hardlight™, Three Rings™, and Demiurge Studios™, and SEGA has investments in Space Ape Games™ and Ignited Artists™. Recent SEGA mobile titles include Sonic Dash™ , Sonic Jump Fever™ and Crazy Taxi™ City Rush. For more information, visit www.sega.com. Based in the UK and founded in 2012, Hardlight Studio is an internal development studio owned by SEGA Games Co., Ltd. Composed of a small, dedicated team with drive, passion and creativity, Hardlight focuses on making high-quality games for mobile devices. Hardlight is behind the latest critically acclaimed adventures of Sonic the Hedgehog™ on mobile platforms: Sonic Jump Fever™ and Sonic Dash™, as well as Crazy Taxi™ City Rush. For more information please visit: www.hardlightstudio.com.